The weather is nice in Togo this week, it is cooler, and no rain. I watched a man use a bucket to water the lawn inside the compound house today; this struck me as funny, because it is always raining in Lome, Togo. Oops, this is not correct, when I was in Togo before, it probably was the rainy season. The reality is that watering a lawn is an odd occurrence on planet earth, very few people on the earth actually have lawns, and if they do, they neither mow them nor water them. Maintaining lawns is for a rich mans house, which is about five percent of the planet. Alternatively, maybe you can say, one in 20 homes maintains the lawns. There are rich folks in all countries on the planet; however, I seldom get close enough to see them, because we are avoiding each other. 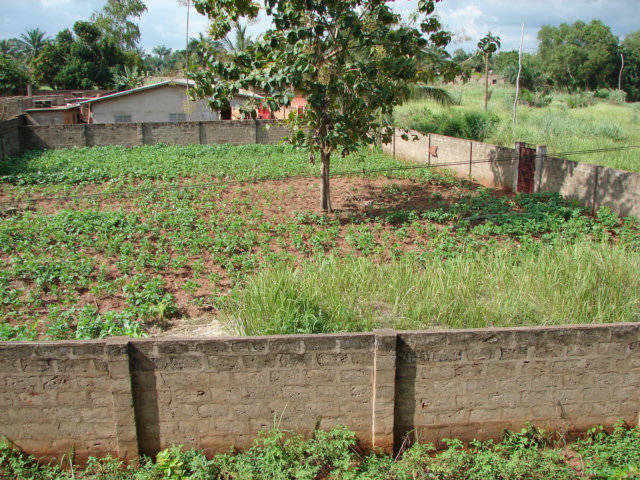 This photo was taken in Savalou Benin West Africa, on, Thursday, September 21, 2006. When people layout lots for the majority of homes on the planet, there first action is to layout the walls. I call this the "Compound," then inside the walls; you can find the "Compound House." There is a beauty problem; normally it is difficult to appreciate a beautiful home, because it was built behind a large wall. I do not like walls, I do not enjoy locked doors, there is something afraid inside or outside. I seldom lock the door or my hotel room until I am going to sleep, and then only because drunks want to enter the wrong room. If God was here, he'd tell you to your face, man you're some kinda sinner"
--- Song by the Five Man Electrical Band called "Signs"
"Andy, I do not understand." "I do not understand what you wrote, therefore you are stupid." Which is humorous, I made a decision long time ago when dealing with employees on who carries the burden of understanding, me the boss, or my employees. I finally realized, if an employee does not understand repeatedly, then I need to fire them. The burden of understanding is on the employee, if he or she does not understand, or intuitively is a nitwit, the only option is to can the person. In addition, I have used the same reasoning process on writing. The burden of understanding is on the reader, I do my best, then they must try to understand. Comments on Blogs have allowed the reader to voice and expose their inner thoughts in an anonymous way, comments are not always needed, like or beneficial. Writing is not a democracy, writing is opinion, it is a has the goal of a dictator the same as being a boss, a business is not a democracy. What readers enjoy when I allude to something, and then give them hints or clues on how to follow up and learn more. Sometime I use insider travel jargon that is meant to allow specific readers to feel knowledgeable; I do not do this often. The other painful thing about writing about travel is the need to loop readers into awareness by talking about something they know, and comparing it to something foreign. Food is the easy example; I could explain a new fruit, by taking a photo and comparing to fruit the readers knows. When a reader says or writes, you cannot compare cultures, this is ignorant, without a comparison there is no frame of reference, there is no beginning, middle or end. When a travel writer says, the country is beautiful, and no comparison I think, how stupid. There are small mountains in Ghana, the people riding in the van started wooing and aahing about how beautiful. In reality, there were hills, not much of a mountain. They were about the size of the hills in Southern Indiana around Brown County, but not even 10 percent as beautiful. Often guidebooks are just clichés, truly of little to veteran travelers who can and will compare. Writing a guidebook is more of factual practice, not a writer paradise. Therefore, when I write, I focus on comparing, then telling the price, and giving my best brutish description, a person may be actually planning to visit Togo, I feel responsible, I am responsible for a few trips. I implore you, please do not do anything to change your grammar. Colleen posted comment on the prior post requesting I never change my grammar. One of the easy requests, and the truth is the same, I can neither improve nor degrade my grammar, all changes are slow and tedious. 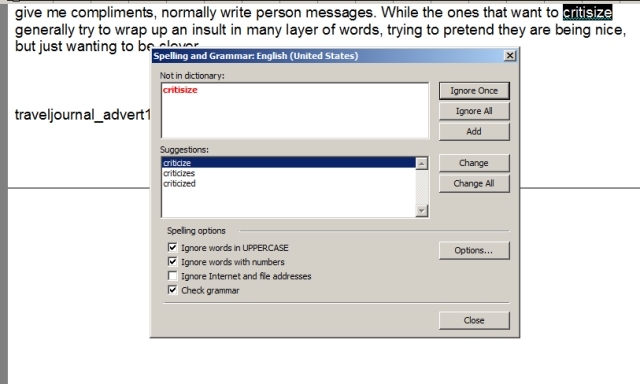 My grammar has improved over the years, as the Microsoft Spelling and Grammar checker has in slowly pointed out major mistakes. The problem is the subtle conflicts, the program does not correct or instruct at a professional level, more or less it allows for simple corrections. I have searched for more advanced spelling and grammar programs to teach, however, in the end, I need to work with an English Teacher on a daily basis for a few months. We have tried to hire grammar editors in the past, and have an online employment application, however have forsaken this, I will stumble upon a teacher someday. I need to have specific problems solved as they happen, which required a dialogue with a human, a question and answer conversations. Where I can delve into the intricacies of what if this, and what if that. I am not capable of reading a paragraph of explanation and grasping grammar. My brain can look at computer and explain in seconds; however, with grammar it takes extreme focus and study, nothing comes easy. I have a book about 80 percent done; the last 20 percent is going to take a lot of energy. I must study extensively the "The Chicago Manual of Style," to learn how to layout references, glossary and annotations in the book. I use an incredible amount of "Travel Jargon" in my writing, and need to be clear; a person reads a book to avoid confusion, while people reading on the internet appear to enjoy the constant poke and surf, speed-reading method. Truly, I feel good writing is wasted when done first on the internet; the debut of exceptional writing is best showcased in a paper book. 21 Megs, you need a good connection of the program Flashget.com, which will allow you to slowly leech it down whenever you have a connection. I receive many compliments on my writing, maybe three or four per week. People that want to give me compliments, normally write personal e-mail messages. While the ones that want to criticize generally try to wrap up an insult in many layer of words encased in a comment. They pretend they are being nice, but just wanting to be clever, we call them Trolls or Flamers, and they are evil in their intention. "Liked Comments | Disliked Comments." We blatantly copied the "like" part of Facebook, the reason is simple, Facebook.com has already "Branded" the phrase and readers are familiar with the word like. When designing a web site, it is better to ride on the wave of existing skills and not force readers to learn, we want to lure reader in on a path of familiar territory, and then slowly engage them to learn our site. Give them a familiar taste, allow them to like, then give them a bigger bite. Facebook is one of the stickiest sites on the internet, which works against the site when trying to make money; people must click on an advertisement and un-stick themselves from the site for Facebook to thrive. Generally, Facebook is just too tricky, and is becoming a little too much of a spammer disguised as nice. Here is an interesting article about a business owner leaving Facebook. I think he is being a little radical; we must do business with companies that dominate markets. If I refused to talk with people I do not respect, I would never leave my room. "Andy you are extremely opinionated." However, I am not judgmental, I will allow a person to change, judgmental people never allow people to get even close enough to annoy. Fun stuff and the secret to happiness is learning to adapt, and navigate around all the emotional stones in the middle of the river of life. Plus, there are some stones worth living with, we must accept that bad is a necessary inclusion to perfect, with out the bad, how would be learn to appreciate the good. Hmm, I suppose it sounds like I disapprove of walls. I approve of the walls, I just do not feel good inside. Walls are 100 percent necessary, I am always inside a walled compound, I miss the open home situation of Indiana. Respect for other humans is the basic problem. 80 percent of the planet believes cutting line, giving a bribe, or somehow putting themselves above others is fine. This means we truly needs wall or the people would walk by and steal everything not tied down.